The minor pentatonic scale is a fantastic scale to jam over a 12-bar blues with, but by adding a few more notes you can infuse your blues with the slick sounds of virtuoso blues-meisters such as Joe Bonamassa, Robben Ford and more. Practise the basic minor pentatonic scale first (black dots are root notes; red dots are other scale notes). When you get a feel for this, try adding in the extra non-scale notes that we’ve highlighted in green. This is the progression you’ll be playing over. It’s the most common form of the 12-bar blues, but it is common in music to see the arrangement of chords moved about a bit. Notice that there are only three chords throughout: A7, D7 and E7 (a I-IV-V in the key of A). We've provided a backing track for you to jam over. This lick is played over an A7 chord. Solos tend to sound much better if you can land on a note from the backing chords, so, in this case, we’re adding a 6th fret C# note from the A7 - all the rest of the notes come from the minor pentatonic scale. Although the chord has changed to D7 here, the A minor pentatonic notes all still work. Make a feature of the chord change by adding the major 6 interval, which is on the 4th fret of the fourth string. This is a fantastic note to add when playing over a IV chord. 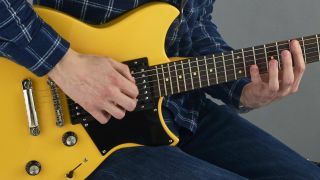 The V chord is the point at which the 12-bar blues is at it’s most tense, so why not make the most of the tension and make the solo even more dramatic? The b5th interval sounds great over a 12-bar blues, especially if you save it for the V chord. The final two bars of a 12-bar blues are known as a ‘turnaround’. This is the point that we prepare to go back to the start of the loop and start the next phase of the solo. Most blues players have a collection of ‘turnaround’ licks that round off their solos.